Just because we are not yet sure if the market has truly bottomed does not preclude us from making some near-term assumptions. Simply put, if the major indices follow the Dow Jones Industrial Average higher to their respective 200-day moving averages (the Dow already tested it today and is showing no initial signs of failure) then it becomes more likely that the relief rally underway may have some more breathing room into AAPL earnings tomorrow night, if not the midterm elections early next week. Bears, indeed, had a plethora of chances in recent sessions to truly crack this market lower for a proper washout or even crash, but blinked at just the wrong times. While the corrective of bearish nature of the overall price action in October has not yet been negated, we also must continue to allot or a standard multi-day or even multi-week relief rally before champing at the bit to hop back on the short side (and/or long volatility side). The old saying is to "not try to catch a flying arrow" in the form of shorting an explosive rally too soon. And given that the late-morning fade today got plenty of traders nice and cautious before we went higher yet anyway, my sense is to respect that old axiom for now. Also note the strength of natural gas this autumn. 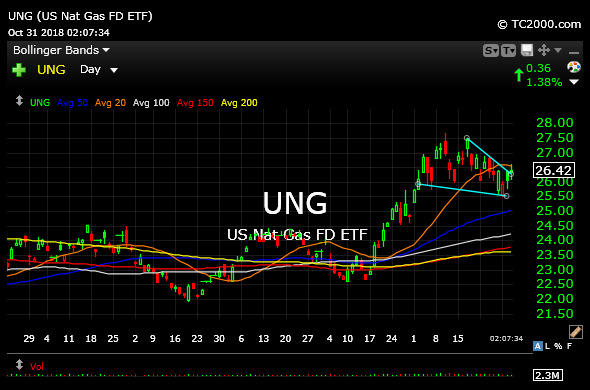 The UNG ETF daily chart, below, sports a clean pattern in a new uptrend. As a result, a play like RRC off its 200-day moving average has my eye for a bounce.